Davis Square Avengers - View topic - Holy Crap Animals! I want this to be my next birthday party. Well, you need to make a bunch of corgi friends, don't you? Oh noes! 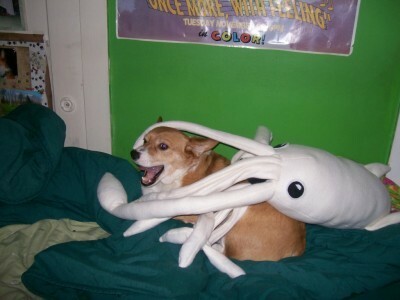 Cthulhu is eating the corgi! A beagle playing catch...almost human-style. Corgi does not want to walk today. Meanwhile, dog doesn't know why his new friend won't throw the stick. Skip to about 30 seconds in to see a cat hugging her kitten! Spider Corgi, Spider Corgi, does whatever a Spider Corgi does! Puppy has OMG BEST BIRTHDAY EVAR. HIlariously, some posters have noticed that you can see a certain...apparatus in the shots under the bed, LOL. Not quite a novel concept, but synchronized kitten dancing is still entertaining. And now 90 seconds of pandering to the Katies in the audience.